Amid a summertime swarm of hundreds of earthquakes underneath Yellowstone National Park, NASA is developing a plan to tame a "supervolcano" that some experts believe is well overdue for a catastrophic eruption. The scientists' plan: cool down the volcano. Volcanoes erupt when a certain heat threshold is built up within the magma, meaning that if enough heat can be let out of the volcano, it will never erupt. NASA's idea is to pump water into the volcano after opening up a path via drilling. In theory, the plan would extract heat from the volcano and could even provide a new geothermal power plant. There's only one problem: The process might trigger an eruption. Brian Wilcox of NASA's Jet Propulsion Laboratory at the California Institute of Technology told the BBC an attempt to drill from the top of the magma chamber could accidentally cause the very thing the drilling was designed to prevent. To avoid that risk, he suggested drilling from outside the borders of Yellowstone and coming into the supervolcano from the lower side. But some suggest such schemes are doomed regardless of how they are executed. Jerusalem Rabbi Rami Levy said science has limits and told Breaking Israel News natural disasters and earthquakes will be an inevitable feature of the end times. What do YOU think? Should scientists do anything to stop U.S. supervolcano? Sound off in the WND Poll! He said the natural disasters are "explicitly described in the Bible," and the response should be "repentance." Joel Richardson, New York Times best-selling author of "The Islamic Antichrist" and the new book "Mystery Babylon," urged caution, insisting such disasters are not necessarily a sign the end is nigh. But he said they could have supernatural significance. 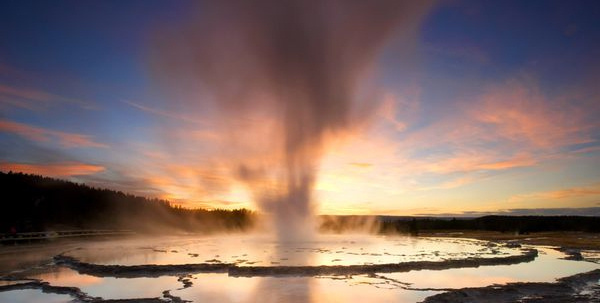 "Because both natural disasters and catastrophes caused by mankind are common throughout world history, I am hesitant to refer to something like a potential catastrophe at Yellowstone Park as an apocalyptic event," Richardson told WND. "In other words, I would not see it specifically as a biblical sign of the return of Jesus or of the end of the age. "That said, neither are such events merely coincidence. The Lord often uses catastrophes to either speak to mankind or to humble mankind. His ultimate purpose is to save as many as possible from the lake of fire," said Richardson. "Whether we are speaking of a potential supervolcano, a flood, an eclipse, the global refugee crisis or any other catastrophe, believers are called to look not merely at the destruction and loss, but at what God is doing redemptively through such catastrophes." Richardson did enthusiastically endorse the response of "repentance" as appropriate, saying such actions by a nation can indeed forestall catastrophe. "God gives grace to those who humble themselves before His mighty hand," he said. "There is no question that the Lord is giving the United States ample opportunity to fall on our collectives faces and ask for His forgiveness and seek His restoration." One of the greatest mysteries in Scripture – solved at last! Discover the terrifying truth behind the shadowy identity of one of the greatest horrors of the end times. New York Times bestselling author Joel Richardson reveals the secret of "Mystery Babylon." Available now in the WND Superstore. Jan Markell of Olive Tree Ministries also believes "repentance" is a timely message for the United States and said current events make the message especially important. "Author Jonathan Cahn spoke heavily of repentance in his book and film about ‘harbingers,'" said Markell. "He warned that if America did not repent, America would be judged so severely we might never recover. Much of the church hailed this message but parts of the church mocked Cahn and thought both he and his message were unstable and sensational. I think his message was profound. "Our country won't prosper just due to politics. It won't prosper thanks to efforts at ‘social justice.' It requires a spiritual awakening and national repentance. If God were to see America truly sorry for the sins we have committed and intensified in the last 30 to 50 years, He might change his mind and slow down some of the destruction. Right and left are at war with each other. Washington has been rendered nearly ineffective due to infighting. Hurricane Harvey has shaken most Americans. Good old-fashioned repentance can't hurt and it could possibly slow some of the deterioration of the country we've seen in recent years." Markell also believes an explosion at Yellowstone in the near future is possible. "I think something could happen in the Yellowstone area any day," she told WND. "The question is, how drastic will it be? It would just be another warning that time is short. I think an explosion with catastrophic results would be reserved for the Tribulation time outlined in the Bible." A remarkable story of finding God's light in a time of darkness. Don't miss this testimony of faith amid the Holocaust. "Trapped In Hitler's Hell" is available as a book or documentary in the WND Superstore. Mark Biltz, the man who discovered the "Blood Moons" phenomenon and the author of the new book "God's Day Timer," said natural disasters that God intends to happen cannot be prevented. And the pastor believes that as the world nears the end times, "apocalyptic events would happen within nature as signs of His coming." However, Biltz said that does not mean mankind is helpless. "In the physical realm, what is in our control is how we respond to the early warnings," Biltz said. "In Houston during Hurricane Harvey for example, the people were sent mixed communications on whether or not to evacuate the affected areas. "From a spiritual standpoint, humanity has been receiving early warning signs of the soon coming of the Messiah and spiritual leaders have also been sending mixed signals. Many are responding as Lot did to the coming destruction of Sodom and Gomorrah while others are interceding in hopes of mitigating what's coming. When Messiah comes it will be suddenly and there will be no time to react. This is why we need to heed the early warning signs as I have laid out in ‘God's Day Timer.'" Like Rabbi Levy and others, Biltz believes widespread movements of repentance have the power to mitigate natural disasters. "The Bible states that the Earth responds to mankind's actions," the pastor said. "The Promised Land vomited out its inhabitants because of how they defiled it. Israel was warned that they too would be vomited out as well depending on their behavior. I highly recommend that the people of God in America repent and return to the authentic God of the Bible not one that we have created in our own image." The Bible story is more miraculous and astounding than you could have imagined. See the remarkable proof of the unchanging nature of God – and the exciting clues to what awaits at the end of days in "God's Day Timer" by Mark Biltz, available as a book or documentary now in the WND Superstore. Pastor Carl Gallups, author of the end times examination "When The Lion Roars," advocates a "balanced" approach towards these issues. He does not deny the power of science, nor does he believe there is something somehow wrong with trying to prevent disasters. But Gallups cautions against viewing a move towards "repentance" as a quick fix or something that will simply make disasters less severe. "Humanity was given the responsibility to have dominion over the earth and to ‘subdue' it," he explained. "There is nothing biblically wrong with exploring the most viable scientific ways to provide for the Earth's population, but we should also remember there are some things that we simply cannot control or manipulate. In fact, we could actually make the situation worse. We must also consider that the Word of God is clear that in the days before the return of Jesus Christ there are going to be all manner of uncontrollable and disastrous events involving the natural realm and its own fallen condition. "For the believer, this is a relatively easy balance to maintain: We do what we can to provide for the safety and humanitarian needs of people, the ecosystem, and general living conditions, while at the same time understanding that ultimately all of this in the Lord's hands and in accordance with His decrees. Those who believe ‘science' is the ‘savior' of the world are wrong. "But even those that are more religious will often turn to the hope of ‘quick fixes.' There are those who are calling for ‘repentance' to avert the seemingly impending doom – and while repentance is always a biblical and good idea for anyone, it is not a magic incantation to ‘ward off evil happenings.'" The longtime pastor concluded the best way to respond to the possibility of disaster is through preparedness, as he described in his book "Be Thou Prepared." "The creation is fallen – and sometimes we are its victims," Gallups said. "In the midst of it, however, we must always look for ways to bring relief and comfort to those around us and to take advantage of every opportunity to share the only Good News offered to humanity that has real teeth in it – an old rugged cross and the empty tomb of Jesus Christ." Extraordinary events predicted centuries in advance are unfolding now. Here is your guide to the remarkable prophecies being fulfilled before our very eyes. Don't miss the best-selling sensation from one of America's most prolific and beloved pastors. "When the Lion Roars: Understanding the Implications of Ancient Prophecies for Our Time" by Carl Gallups, available now in the WND Superstore.